KIEV. Ukraine -- Ukrainian forces struck at pro-Russian separatist bases in eastern regions with air and artillery strikes on Tuesday after President Petro Poroshenko announced he would not renew a cease-fire but go on the offensive to rid Ukraine of "parasites." 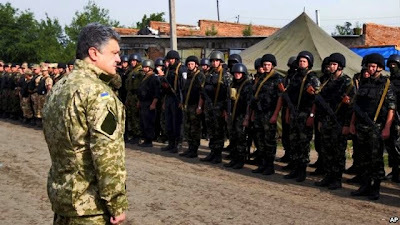 In this photo taken June 20, 2014, in Izyum, near Slavyansk, eastern Ukraine, Ukrainian President Petro Poroshenko visits troops. Within hours of Poroshenko's early morning announcement, the military went into action against rebel bases and checkpoints in the east which has been in separatist ferment since April. "The terrorists' plan to significantly escalate armed confrontation has been disrupted and the threat of losses to the civilian population and service personnel has been liquidated." Gunfire broke out in the center of a major city in eastern Ukraine as gunmen appear to be trying to take control of the regional police headquarters. Gunfire broke out Tuesday afternoon in Donetsk, the capital of one of the two regions that pro-Russian insurgents have declared independent, the Associated Press reported. Gunmen appeared to be trying to take control of the regional police headquarters. An AP journalist saw some blood on the streets but no wounded people. Russia on Tuesday warned authorities in Kiev they would be held responsible for the ongoing military operation against separatists in eastern Ukraine after they refused to extend a unilateral cease-fire. "One will have to answer for the crimes against peaceful civilians," the foreign ministry said in a statement. "We demand that Ukrainian authorities stop shooting at their own country's peaceful cities and villages and return to the real and not pretend cease-fire to save people's lives." Poroshenko, who accuses Russia of fanning the conflict and allowing fighters and equipment to cross the border to support the rebels, turned his back on another renewal of a 10-day unilateral cease-fire after several days of four-way telephone talks involving the German and French leaders and Russia's Vladimir Putin. Showing impatience at what he had heard from Putin, Poroshenko said in his early morning statement that Ukraine had not seen "concrete steps for de-escalating the situation, including strengthening controls on the border." European Union governments decided on Tuesday that they were not ready to immediately impose new sanctions on Russia over the crisis in Ukraine, as a cease-fire to allow for peace talks expired and fighting broke out in the east of the country. Senior EU diplomats met in Brussels Tuesday morning to consider whether new measures were needed after a summit of EU leaders on Friday warned Moscow that sanctions were on the cards if peace talks didn't produce results. "(They) decided they will monitor the situation," one EU diplomat said, speaking on condition of anonymity. "The picture on the ground is mixed. In the meantime, there are intensified preparations for sanctions." Two other diplomats confirmed the assessment. In Moscow, the foreign ministry hinted that the United States stood behind Poroshenko's decision not to extend the cease-fire. "There is an impression that the change in Kiev's position … could not have come about without influence from abroad, despite the position of leading EU member states," it said in a statement. Separately, the speaker of Russia's lower house of parliament called for a new cease-fire. "We think that without a truce, without the start of dialogue, it is simply impossible to restore peace, justice and law and order in Ukraine," Sergei Naryshkin, an ally of Putin, was quoted as saying. Poroshenko, just over three weeks in office, is also facing rising anger at home and from the new political establishment over military losses. He is under pressure to switch to more forceful action against the rebels after a ceasefire which many say was used by the rebels to regroup and rearm. A statement tweeted by the Ukrainian foreign ministry on Monday night said 27 Ukrainian servicemen had been killed and 69 wounded since the ceasefire began on June 20. Poroshenko, announcing the military would now act to answer the "terrorists, militants and marauders," accused the rebels of failing to keep to the truce or follow a peace plan he had outlined. Later on his Facebook page, the 48-year-old leader warned the future would be difficult, adding: "we must be united, because we are fighting to free our land from dirt and parasites." "After the president's speech, the ATO (Anti-Terrorist Operation) went into action. We opened artillery fire, carried out airstrikes at the strategic points of the terrorists and places where they are concentrated," military spokesman Oleksiy Dmytrashkovsky said. Rebels had fired on an SU-25 attack aircraft, damaging it, but the plane had managed to land safely at its air base, he said. He denied a rebel report that a military helicopter had been brought down. Poroshenko said he was willing to return to a cease-fire "at any moment" if it became clear that all sides were ready to carry out all aspects of the peace plan, including the freeing of hostages and creating effective border controls. Poroshenko had extended a government cease-fire last week until 10 p.m. (1900 GMT) on Monday to allow for peace talks with a contact group involving separatist leaders, a former Ukrainian president, a senior representative of the OSCE rights and security body and Moscow's ambassador to Kiev. "The unique chance to implement the peace plan was not realized. It happened because of the criminal actions of the militants. They publicly declared their unwillingness to support the peace plan as a whole and in particular the ceasefire," Poroshenko said. Experts, who believe Russia is actively supporting the insurgency, say that Moscow is pursuing a two-pronged strategy in Ukraine. Pavel Felgenhauer, a defense analyst and columnist with Novaya Gazeta newspaper in Moscow, says that on the one hand the Kremlin arms and otherwise supports in order to maintain leverage with the pro-Western government in Kiev. “So Moscow, though wanting a freeze of the present situation, more or less as it is, and Moscow not wanting the separatists to be militarily defeated, is supplying arms not in an attempt for kind of help the rebels march on Kiev, which is hardly possible, but to uphold some kind of military balance on the ground,” says Felgenhauer. On the other hand, the expert says, Moscow tries to create a pretext for an incursion. “They hope that if they provoke more fighting and if the Ukrainian military will begin to grind [rebels] up and there will be high civilian casualties as a result, this will force Moscow’s hand and Moscow would intervene militarily,” says Felgenhauer.